The economic crisis in Greece is not just catastrophic for its people but threatens to undermine and break up relationships across Europe and beyond. It also raises some big questions about European and global capitalism. The fate of Greece, a small nation, appears to be being decided according to the interests of the global financiers and their political representatives, along with the powers that be in the European Union, European Central Bank and the International Monetary Fund. These three institutions, known as the ‘troika’ ~ a term which denotes a Russian vehicle pulled by a team of three horses abreast is also used to describe a group of three working together in the areas of management and administration. 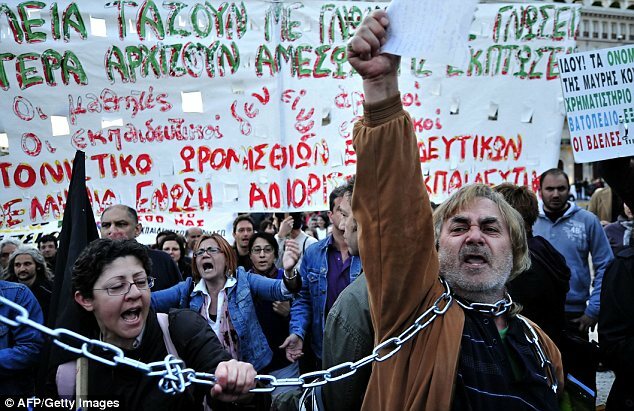 This financial ‘troika’ has imposed impossible demands upon Greece and the Greek people have had enough. The massive turnout and overwhelming vote on Sunday’s referendum was a clear indication to the financial superpowers that they would no longer be dictated to and that the impossible demands that were being placed upon them was a burden that the nation could no longer bear. The people of Greece have spoken. The mass working-class population, the poor and marginalised, who often don’t vote on such occasions, turned out in force, in opposition to the crippling austerity measures. With the recent commemorations of the Battle of Waterloo, it is interesting to note the parallels with the Peterloo Massacre of 1819 and the unrest now in Greece. The end of the Napoleonic Wars in 1815 had resulted in a period of famine and chronic unemployment, exacerbated by the introduction of the first of the Corn Laws. After the end of the Napoleonic Wars in 1815, a brief boom in textile manufacturing was followed by a long period of chronic economic depression, particularly among textile weavers and spinners. The workers could have expected to earn 15 shillings for a six-day week in 1803, but saw their wages cut to 5 shillings or lower by 1818. The industrialists, who were cutting wages without offering relief, blamed market forces generated by the aftershocks of the Napoleonic Wars. Making matters worse were the Corn Laws that imposed a tariff on foreign grain in an effort to protect English grain producers. Consequently the cost of food rose as people were forced to buy the more expensive and lower quality British grain. This resulted in famine and chronic unemployment throughout much of Britain which fuelled the desire for political reform. 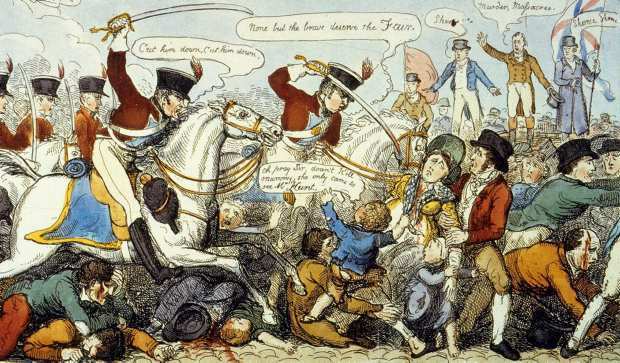 weeks and months after Peterloo , which captured the brutality of the event. Against this background, a “great assembly” was organised by radicals from the Manchester Observer. The newspaper’s founder Joseph Johnson wrote to Henry Hunt, a radical spokesman for the protest movement demanding reform, reporting that, “ Nothing but ruin and starvation stare one in the face in the streets of Manchester and the surrounding towns; the state of this district is truly dreadful, and I believe nothing but the greatest exertions can prevent an insurrection. Oh, that you in London were prepared for it.” Unknown to Johnson and Hunt, the letter was intercepted by government spies and copied before being sent to its destination. The contents were interpreted to mean that an insurrection was being planned, and the government responded by ordering the 15th Hussars to Manchester. The Peterloo Massacre occurred at St Peter’s Field in Manchester on 16th August 1819, when the cavalry charged into a crowd of nearly 80,000 that had gathered to demand parliament make reforms. Local magistrates had called on the military authorities to arrest Hunt and several others on the hustings with him, and to disperse the crowd. The cavalry charged into the crowd with sabres drawn and 15 people were killed and over 700 were injured. The massacre was given the name Peterloo in an ironic comparison to the Battle of Waterloo which had taken place four years earlier. Just as the masses gathered in Manchester to protest against the austerity measures imposed upon them, so too this week, the Greek people have declared that they have had enough and things have to change. They are not going to tolerate any more the crippling debt that has brought so much untold suffering to the nation. I believe that we will see in the coming months and years a heightening of social tensions across Europe which is rooted in the seemingly irreconcilable conflict between the most basic needs of the growing masses of the poor across the continent and the wealthy institutions of capitalist Europe; a divide between the richer and more powerful northern nations and the poorer nations of the south. 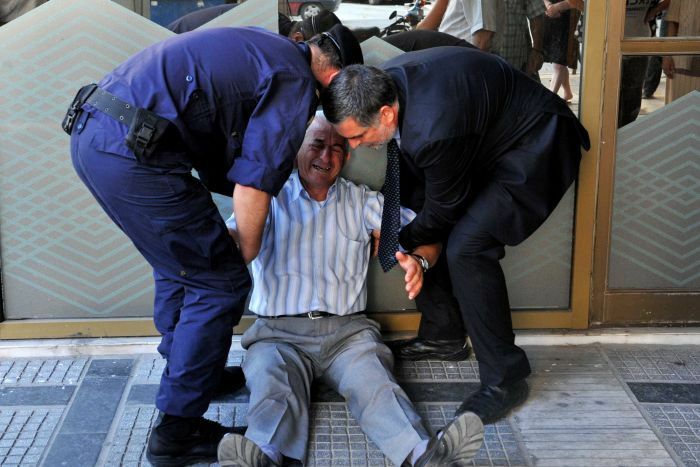 You can see the threats and bullying behaviour of those who wish to “punish” Greece for its decision. Several representatives of the troika have said that Greece needs to be made an example of so that others don’t take a similar stance and suffer the same consequences. 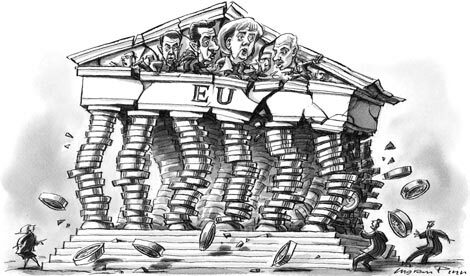 If Greece does leave the EU, either by choice or being expelled, it will hasten the collapse of much bigger economies such as Spain, Portugal and Italy. According to the Institute of International Finance, an estimated global cost of a Greek exit would be something in the region of $1.2 trillion, entailing “killer losses” and would push the continent into a 1930s style depression. For me what is happening in Greece, raises some fundamental questions about the failure of a predominantly unregulated capitalist system to deliver equal opportunities and justice to the world’s population. We are seeing on an unprecedented scale that the capitalist free market policies are escalating the divide between rich and poor. History reminds us that such conditions provide the breeding ground for social unrest, conflict, war and is certainly a major contributor to the horrors of terrorism that threaten the world. The austerity imposed upon the Greek people over the last five years has neither reduced the debt nor has it improved the conditions of the Greek people. The austerity measures have produced considerable suffering, no improvement and no chance of getting out of the debt crisis. Businesses are closing, public services are being cut, unemployment levels are horrendous, disillusionment and despair is setting in. They are struggling to keep their pensioners having enough to live on and to prevent the vast exodus of tens of thousands of younger people who are trying to leave the country to find employment elsewhere. Greece is a small country and it cannot keep haemorrhaging its best and brightest people at the same time as everybody else’s incomes are collapsing. That is why people are anticipating a depression similar to that of the 1930’s with hundreds of thousands of desperate people and crippling poverty. The inequality between over 90% of the Greek population who are poor and the 5%, the rich and corporations is polarising the nation and causing civil unrest. The danger for the big financial European and International monetary institutions is that by pushing as hard, demanding and bullying and causing the suffering of many in Greece and other parts of poorer nations in Europe, is that they may reap a whirlwind of anti-capitalist fervour across the continent. The propaganda war started a long time ago; it runs like this: We, the Germans, Brits and other developed nations in the West work hard and deserve our affluence as opposed to the Greeks, who don’t. It’s a piece of propaganda that the Republican campaign in America tried to run in the last Presidential elections and it’s a narrative that is now shaping British politics; ‘hard working people who are having to carry the benefit scroungers and undeserving poor’. By playing such a dangerous propaganda game, there is an inherent potential of a nationalist card that might trump the others in the pack and stir racial hatred, conflict and potential war.What’s really going on with austerity becomes therefore a class war. As an economic strategy, austerity, during periods of recession, makes little sense. It actually makes matters worse. This is a fact that the current government somehow managed to get away with in the run up to the recent General Election. The previous coalition government ran up more public debt than all the Labour governments since 1900 combined and they missed their own borrowing targets by billions. The current government’s now responsible for £517 billion of the trillion-plus-pound UK public debt. To be able to get away with the propaganda that Labour caused the debt, (forgetting there was a global economic recession) is sheer hypocrisy but a brilliant electioneering strategy that worked. Labour was irresponsible but not wholly to blame for the global economic crisis we are currently faced with. Those who are crippled by debt, whether in Greece or here in Britain, with no ability to invest and grow, get into more debt. Fact not fiction. The full scale of this week’s Budget in Britain when analysed hits the poorest in our country more than anyone else. £12bn taken from the poorest in society is terrible. The Institute for Fiscal Studies reported today that over 3 million households in Britain would be £1,000 a year worse off as a result of the cuts to tax credits, with low-income workers hardest hit. I met a young mother yesterday, who with her husband work in the voluntary and caring sectors, are on low pay and they, doing their income calculator following the Budget, will be nearly £1,500 worse off a year. What is often forgotten in a financial crisis is the actions of the banks. In lending money they too entered into a risk, yet being as powerful and unaccountable as they are, they can not only write the rules but rewrite them. Far from being casualties of the crisis there are in many ways perpetrators and have become persecutors of the suffering victims; the populations of weaker economic countries. The idea that Greece and other countries have lived beyond their means if both offensive and stupid. Most countries including our own, borrow, most of the time, at alarming rates. 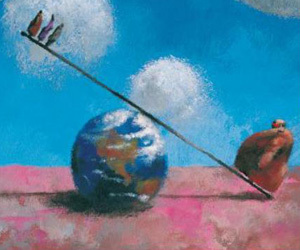 We are all guilty in the Western world of “living beyond our means” and we’ve been doing it for many years. For example the USA has tripled its outstanding debt and is living beyond its means on a scale unprecedented. Countries like Greece were not so much borrowing too much but they faced a situation where their lenders were no longer interested in investing any further. Remember banks and financial institutions make money off the huge fees they charge. In the Bible it’s called extortion. 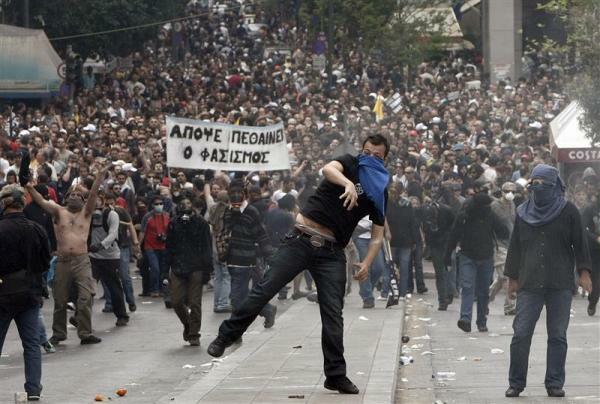 The biggest problem for Greece was the global economic collapse of 2008. Suddenly, every major capitalist country, led by the USA, had to borrow hundreds of billions of dollars and that meant every bank, lending body, every insurance company suddenly had an immense increase in demand for its loans. Seizing the opportunity to lend, often what they didn’t have, and they need now a return on their loans are able to pick off the easy targets, like Greece, leaving their banks and the big financial institutions untouched. What is also often lost amid the discussions on the present financial crisis and the policies that are being pursued by Germany and its powerful European allies is the historical irony of what happened to the German nation back in 1953. Germany was suffering greatly as a result of both the Great Depression and the fact that they’d lost the Second World War. They appealed to the United States, France and Britain, pleading for help with their escalating debts. These crippling debts hampered their ability to grow. They also argued that they were unable to stand with the Allied nations against the threat of the Soviet Union because of the weakness of their economy. The so-called “London agreement” of 1953 saw the economic powers of the USA, France and Britain wipe out 50% of Germany’s outstanding debt and the other 50% is stretched out over 30 years. In effect, Germany got the relief of all its basic indebtedness, based on two world wars that they were held accountable for and it was that “debt cancellation”, what the Bible calls Jubilee, that unable the German nation to experience its Wirtschaftswunder, the economic miracle that made it such an economic force in the developing Western world. How ironic, that Germany with other European powers are now refusing to give to Greece what they themselves received! 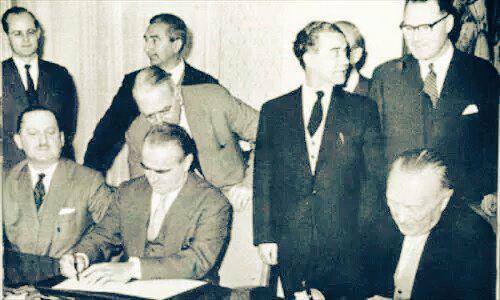 Greece’s finance minister at London Conference of 1953 signing a treaty agreeing to cancel 50% of Germany’s debt. You shall count off seven weeks of years, seven times seven years, so that the period of seven weeks of years gives forty-nine years. 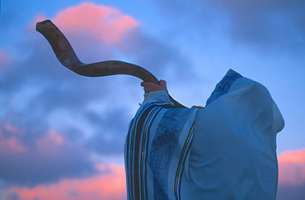 Then you shall have the trumpet sounded loud; on the tenth day of the seventh month, on the day of atonement. You shall have the trumpet sounded throughout all your land. And you shall hallow the fiftieth year and you shall proclaim liberty throughout the land to all its inhabitants. It shall be a jubilee for you: you shall return, every one of you, to your property and every one of you to your family. That fiftieth year shall be a jubilee for you: you shall not sow, or reap the aftergrowth, or harvest the unpruned vines. For it is a jubilee; it shall be holy to you: you shall eat only what the field itself produces. In this year of jubilee you shall return, every one of you, to your property. When you make a sale to your neighbor or buy from your neighbor, you shall not cheat one another. When you buy from your neighbor, you shall pay only for the number of years since the jubilee; the seller shall charge you only for the remaining crop years. If the years are more, you shall increase the price, and if the years are fewer, you shall diminish the price; for it is a certain number of harvests that are being sold to you. You shall not cheat one another, but you shall fear your God; for I am the Lord your God. 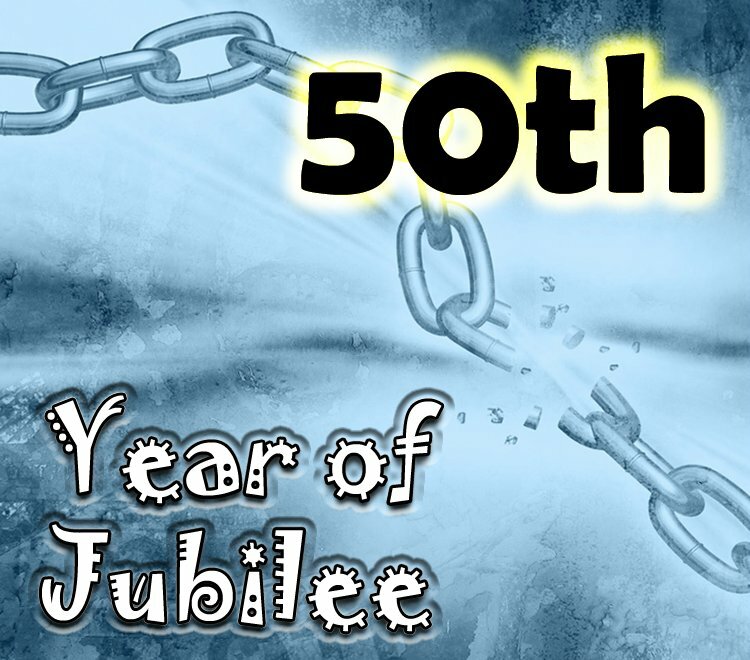 The Jubilee occurred every fifty years and one of its features saw the cancelling of all debts, redistribution of land, property and wealth. Everyone who was in debt was released from them and were able to start over again. In the Jubilee Year all of the slaves and prisoners were set free and all of the land that had been taken by others due to unpayable debts was given back to the original owners. God commanded that, In this year of jubilee each of you shall return to his property and the prisoners and slaves could be set free. Jubilee was God’s way to restore financial and property equality among the nation’s inhabitants so that the disparity between the rich and the poor would be gone. This equality allowed those in extreme poverty who had lost everything and even their own freedom to be gained back in the only way that they could have possible received it. In this way, all of the property of the nation became, in a sense, the property of all and no one family or person could gain an unfair advantage over their fellow citizens. There was also the command to give the land a rest from its labour of producing for the people. 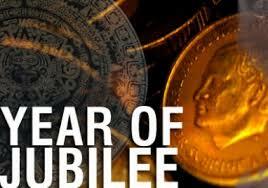 The year of Jubilee was announced with the blowing of the jobel, the ram’s horn, which signaled liberty and freedom. It was an idea as brilliant in its simplicity as it was far-reaching in its repercussions. In a single stroke, the poor were lifted up, the lost reintegrated, creation given a moment to breathe, and the birthright of a future generation secured. As Nick Spencer of the London Institute for Contemporary Chrsitainity says: “The genius of the idea was not in its utopianism but its realism. Early Israel did not pretend the people were naturally selfless or communistic. On the contrary, it presupposed a market economy but tempered its tendency towards inequality and exclusion by basing it on ineradicable ‘stakeholder’ foundations. Every family knew that no matter how hard the times they fell on, their basic stake in society could not be lost for good. Conversely, the successful knew that no matter how well they did for themselves, they would never simply be able to rest on inherited wealth”. That’s why the message of Jesus is so radical and the impact of Christianity so powerful, subversive and non conformist, challenging the ways of a capitalist consumer world and offering a different way of living that brings hope and peace to the world. For the people of Greece, Portugal, Spain and so many other nations, considerably worse off than these, Bulgaria, Burundi, Niger, Ethiopia, Zambia, Mali, virtually every country in Africa, South America, Southern Europe and large parts of Asia, how they must long to hear the sound of Jubilee. But who in the Western world will blow the jobel, cancel the debts, redistribute land and wealth? The Gospel reading for today was as disturbing as the Old Testament reading on Jubilee was challenging. Then Jesus said to his disciples….There was a rich man who was dressed in purple and fine linen and who feasted sumptuously every day. And at his gate lay a poor man named Lazarus, covered with sores, who longed to satisfy his hunger with what fell from the rich man’s table; even the dogs would come and lick his sores. The poor man died and was carried away by the angels to be with Abraham. The rich man also died and was buried. In Hades, where he was being tormented, he looked up and saw Abraham far away with Lazarus by his side. He called out, ‘Father Abraham, have mercy on me, and send Lazarus to dip the tip of his finger in water and cool my tongue; for I am in agony in these flames.’ But Abraham said, ‘Child, remember that during your lifetime you received your good things, and Lazarus in like manner evil things; but now he is comforted here, and you are in agony. Besides all this, between you and us a great chasm has been fixed, so that those who might want to pass from here to you cannot do so, and no one can cross from there to us.’ He said, ‘Then, father, I beg you to send him to my father’s house— for I have five brothers—that he may warn them, so that they will not also come into this place of torment.’ Abraham replied, ‘They have Moses and the prophets; they should listen to them.’ He said, ‘No, father Abraham; but if someone goes to them from the dead, they will repent.’ He said to him, ‘If they do not listen to Moses and the prophets, neither will they be convinced even if someone rises from the dead. Thanks for sharing your thoughts Roy. The political theater at the world’s front stage these last days has me confused. To be honest I am finding it difficult to gain perspective on the matter with so many conflicting stories being told. The last time the nation united to say NO (OXI) was in 28 October 1940 when the Greek denied the Axis forces entrance to the country and strategic positions. I am grateful for all the things Europe (EU) has achieved since the end of WWII, in particular the peace within its borders. My hope that we can continue to work together as a community nations towards peace and prosperity. However, I fear that the political mechanisms that can allow us to progress are stuck. My prayers over the coming days are that our leaders can find the resources to reconcile what appear to be broken relationships between nations. Thank you for expressing this so clearly. The mention of the 1953 German debt write off signed by, amongst others, the Greeks is stark bearing in mind that as I write this it is the Germans who are leading the charge against rescheduling,let alone cancelling, any part of the wholly unsustainable Greek debt.